MRYTLE BEACH, SC (WMBF) When you set out to repair your computer, do you know what you're replacing it with? Some customers say they're not getting what they paid for. "It was extremely frustrating; all the stuff that I got was used, not new, and I paid almost $8,000 for new equipment," said attorney Kirk Truslow. "Not only are they both used, but the other, the desktop is so used, he had to get all new software for it, because they don't even make that now." Truslow is referring to Computers Direct in North Myrtle Beach. He says he got the run around when he tried to ask what happened. "My so called new Mac was registered to a Mark Edward White, who I learned worked at this store or at least another store they were affiliated with." Truslow says he mostly doesn't want this happening to anyone else. "I have moved on, but what these guys are doing is wrong." WMBF News learned Mark Edward White is now the former owner of Computers Direct, but still is listed with the city of Myrtle Beach business license department as owner of Computers & Pawn in Myrtle Beach. We visited Computers & Pawn in March looking for White after other customers complained White wasn't honoring warranties on their computers. WMBF News discovered they weren't the only ones with complaints. Several disgruntled customers made posts on the Better Business Bureaus website. During our visit in March, a man at the store told WMBF News his name was John Smith and asked us to leave. Another employee this week told me they had no comment, even threatened to have us arrested for trespassing if we returned. The new owner registered to Computers Direct in North Myrtle Beach is a convicted felon, according to Chief Enforcement Attorney SC Department of Consumer Affairs Helen Fennell. The U.S. Attorney's Office says Staie pleaded guilty in federal court to conspiracy to commit marriage fraud. They say Staie admitted to being paid to marry a woman so that she could claim permanent status in the U.S.
Timothy J. Staie Jr. is now the owner of Computers Direct, according to the city's business license records, and has been convicted of Marriage Fraud, a felony charge. Staie is also the same man who was listed as owner of Surfside Computers, which the BBB says shut down recently after a host complaints. Because of the felony conviction, the State's Department of Consumer affairs tells us they declined Staie's application to work at the North Myrtle Beach Store. 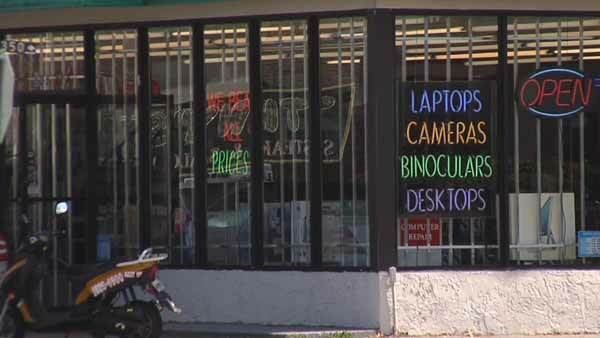 The State Department says the store later withdrew their pawn license, so the State no longer has jurisdiction, though now the City of North Myrtle Beach says they're reviewing the business license. "There's an epidemic going on with this kind of thing, more so an epidemic with it seeming to be these same people, moving from place to place or having stores in different places," Truslow said. WMBF News found more recent complaints filed with North Myrtle Beach Investigators, some of them as recent as this month. The complaints were made over faulty equipment, warranty concerns and poor service. An employee named Jason at Computers Direct told WMBF News by phone he thought Kirk Truslow's case was taken care of, and that he would talk with any concerned customer as long as we were not involved. Truslow says otherwise. "They have not helped me. I never got to talk to the owner; I still have my used gear," argues Truslow. WMBF News tracked down someone who confirms Truslow's complaints. Dan Boissonneault says Staie hired him on a couple of occasions. Each time, he thought Staie was being honest, but Boissonneault says that didn't turn out to be the case. "He was billed for nearly $8,000 of new merchandise and in return he got nearly $3,000 of used merchandise," claims Boissonneault. "I told Staie that wasn't right, and I quit. He still owes me money." Boissonneault says Staie also told him to use used parts on other jobs, and says he saw customers charged for new parts. "It's not right, and now here and P&D Pawn, I always give customers their old parts back and am honest with them," said Boissonneault. "Guys like these give us honest people a bad name." Boissonneault adds, "A lot of tourists, they would prey on because they were at the beach. They had a '$99 Special' where they bought broken Dells by the pallet and patched them together and sell extended warranties and never honor anything for anybody. People would send it back from Ohio and they'd just take it and use it for parts in other ones." "I should have paid better attention, but I was busy and trying to support a local business, but you know, I've gotten over it," Truslow confirms. "What I'd like to do is shed light on it, so people don't continue to get ripped off, especially in this economy." Staie told WMBF News by phone he'd answer our questions, but when we called him back at his suggestion, he never returned our calls. North Myrtle Beach Public Safety says detectives are looking into Truslow's case. Authorities, though, say it's difficult to pursue charges against these types of acts, because often times the dollar amount in dispute isn't large enough. But they say it's important for you to report your problems. Thanks to WMBF for allowing this repost. See their original article here.